What makes fashionistas willing to pay a small fortune for a particular designer accessory? Why does a special occasion only become really special when a champagne cork pops? Why are diamonds the status symbol gemstone, instantly signifying wealth, power, and even emotional commitment? 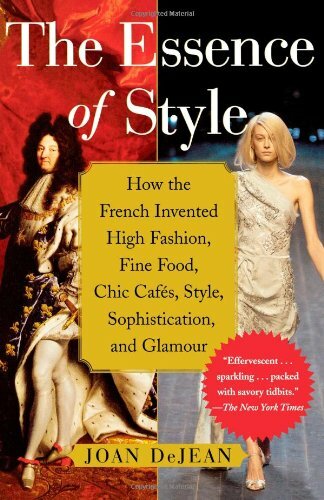 Writing with great élan, one of the foremost authorities on seventeenth-century French culture provides the answer to these and other fascinating questions in her account of how, at one glittering moment in history, the French under Louis XIV set the standards of sophistication, style, and glamour that still rule our lives today. Joan DeJean takes us back to the birth of haute cuisine, the first appearance of celebrity hairdressers, chic cafés, nightlife, and fashion in elegant dress that extended well beyond the limited confines of court circles. And Paris was the magical center -- the destination of travelers all across Europe. Full of wit, dash, and verve, The Essence of Style will delight fans of history and everybody who wonders about the elusive definition of good taste.